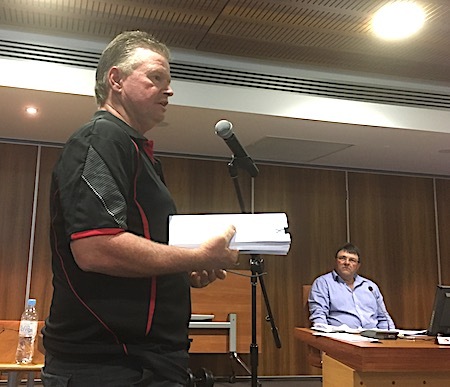 PHOTO AT LEFT: Darren Burton addressing the council last night about a waste incinerator he is planning to set up in Alice Springs. At right is Cr Jamie de Brenni. BELOW: The proposed plant. There were several people in the town council meeting room last night who could have resolved an astonishingly simple confusion – but they didn’t. The issue was a $15,000 grant to the Alice Desert Festival, the decision about which is now delayed by at least a month. The money was approved in 2015/16 to be used for the September 2016 festival. That festival did not take place, so the money is still sitting in the council coffers. This financial year (2016/17), the festival re-applied for $15,000 to be spent for the September 2017 event, and also wanted to get the $15,000 for the festival that had not taken place. The request has been made on the grounds that it now has a deal with Henley on Todd (HOT), involving young people in the annual spectacular. During the finance committee discussions last night Cr Eli Melky said he is the treasurer of the Rotary-run Henley on Todd, but he has no knowledge about any arrangements between HOT and the Festival. During all this time, and further discussion, the festival director, Ben Fox, was sitting in the gallery. At no time did he offer any clarification. He left when the inconclusive discussion ended. This morning Mr Fox declined a request for an interview with the Alice Springs News Online. Mayor Damien Ryan, who also serves on the festival committee, did not ask Mr Fox what if anything is going on between HOT and the festival, nor did he enlighten the meeting about any connection. He had left the room because his connection with the festival was clear. No-one bothered to ask him, out in the hallway, what was going on, and the discussion centred around the intention of the council to give the festival a grant of $15,000, not $30,000. While council members are required to abstain from making decisions about issues in which they have an interest, this does not apply to the initial discussion of whether or not an interest exists, as CEO Rex Mooney appeared to be explaining. Despite the absence of evidence of a deal between HOT and the festival – Cr Melky had said there wasn’t one, so far as he knew – several councillors felt compelled to declare an interest and absent themselves from further discussion about the $15,000: Cr Melky on the grounds that he is the treasurer for HOT, Cr Brendan Heenan because he is a member of a Rotary Club, and Mayor Ryan because he is on the festival committee and a Rotarian. With Cr Steve Brown and Cr Jacinta Price absent, the meeting was then without a quorum. In fact even the adjournment of the issue for a month could not be voted on – it had to be done by deferral. Cr Melky suggested the council should have urgent discussions with the NT Government about any consequences of the $1.3b deficit in the NT Budget. Are there risks of grants not being paid? Or government roads being transferred to the council’s responsibility? The NT’s budget will be brought down on May 2, the council’s in June. The meeting decided to wait till May 12 when the government will conduct a public meeting on its budget, after, of course, the Budget has been decided. Cr Melky said to the meeting that he had put the issue of money from the NT Government before the council in the ordinary meeting a month ago, then in committee two weeks ago, and in the forum meeting on Monday last week. Businessman Darren Burton made a presentation to the meeting about the waste incinerator he is planning, saying it will be the “cleanest in Australia,” reducing rubbish to 3% of its volume. The Canadian plant, proposed for Brewer Estate, would make it unnecessary to move tonnes of waste to SA, including 90 tonnes of medical waste a year. The facility would employ six staff initially, likely to expand to 24. 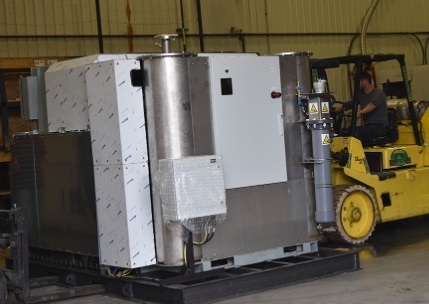 It has zero or close to zero emissions and is fitted with a full-time device for monitoring “what comes out of the stack, just water vapour” for the benefit of the Environmental Protection Authority. Mr Burton says he has no requests from the council – the presentation was part of community consultation required.